نجفی, مسلم, درویزه, ابوالفضل, انصاری, رضا. (1396). ارزیابی استحکام ضربه‌ای مواد کامپوزیتی و چندلایه‌های الیافی فلزی هیبرید شده با نانورس پس از قرارگیری در معرض شوک حرارتی دما بالا. علوم و فناوری کامپوزیت, 4(3), 263-274. مسلم نجفی; ابوالفضل درویزه; رضا انصاری. "ارزیابی استحکام ضربه‌ای مواد کامپوزیتی و چندلایه‌های الیافی فلزی هیبرید شده با نانورس پس از قرارگیری در معرض شوک حرارتی دما بالا". علوم و فناوری کامپوزیت, 4, 3, 1396, 263-274. نجفی, مسلم, درویزه, ابوالفضل, انصاری, رضا. (1396). 'ارزیابی استحکام ضربه‌ای مواد کامپوزیتی و چندلایه‌های الیافی فلزی هیبرید شده با نانورس پس از قرارگیری در معرض شوک حرارتی دما بالا', علوم و فناوری کامپوزیت, 4(3), pp. 263-274. نجفی, مسلم, درویزه, ابوالفضل, انصاری, رضا. ارزیابی استحکام ضربه‌ای مواد کامپوزیتی و چندلایه‌های الیافی فلزی هیبرید شده با نانورس پس از قرارگیری در معرض شوک حرارتی دما بالا. علوم و فناوری کامپوزیت, 1396; 4(3): 263-274. مواد کامپوزیتی نظیر چندلایه‌های پلیمری تقویت شده با الیاف به طور گسترده‌ای در کاربردهای مختلف مهندسی مورد استفاده قرار می‌گیرند. از بزرگترین موانع استفاده از این مواد در کاربردهای پیشرفته، کاهش خواص مکانیکی و انسجام ساختاری آن‌ها در مواجهه با دماهای بالا است. در این مقاله، اثر افزودن نانورس بر خواص ضربه‌ای چندلایه‌های کامپوزیتی و چندلایه‌های الیافی فلزی قبل و بعد از مواجهه با شوک حرارتی دما بالا مورد بررسی قرار گرفته است. به این منظور، نانورس توسط همزن مکانیکی، همگن‌ساز مکانیکی سرعت بالا و همگن‌ساز مافوق صوت به رزین اپوکسی خالص افزوده شد. سپس چندلایه‌های کامپوزیتی و چندلایه‌های الیافی فلزی 2/1 با استفاده از ورق-های آلومینیوم، رزین اپوکسی خالص و بهبودیافته با نانورس و الیاف شیشه توسط روش لایه‌چینی دستی تولید شدند. اثر استفاده از نانورس بر استحکام ضربه‌ای چندلایه-های کامپوزیتی و چندلایه‌های الیافی فلزی پیش و پس از قرارگیری در معرض دمای 230 درجه سانتیگراد مورد بررسی قرار گرفت. بر اساس نتایج به‌دست آمده مشخص شد که نانورس نقش موثری در حفظ خواص ضربه‌ای نمونه‌ها دارد. همچنین به سبب نقش محافظتی لایه‌های فلزی، میزان افت خواص ضربه‌ای ناشی از شوک حرارتی در چندلایه‌های الیافی فلزی کاهش یافت. Composite materials such as fiber reinforced polymeric laminates are used extensively in various engineering applications. Of the greatest impediments to the use of these materials in advanced applications is the reduction of their mechanical properties and structural integrity when they are exposed to high temperatures. In this paper, the effect of nanoclay addition on impact properties of composite and fiber metal laminates before and after exposure to high temperature shock have been investigated. For this purpose, the nanoclay particles were added to pure epoxy resin using mechanical mixer, high-speed mechanical homogenizer, and ultrasonic homogenizer. Then, both the composite laminates and fiber metal laminates 2/1 were laminated by aluminum sheets, pure epoxy resin and modified resin with nanoclay and glass fiber using hand lay-up process. The effects of using nanoclay on the impact strength of composite laminates and fiber metal laminates before and after exposure to temperature of 230 ° C were studied. According to the results obtained, it was found that nanoclay has effective role in maintaining impact properties of the specimens. Additionally, as a result of protective role of metallic layers, the thermal shock induced degradation in impact properties of fiber metal laminates was decreased. Park, S.Y. Choi, W.J. and Choi, H.S., “The Effects Of Void Contents On The Long-Term Hygrothermal Behaviors Of Glass/Epoxy And GLARE Laminates,” Composite Structures, Vol. 92, No. 1, pp. 18-24, 2010. Chung, K. Seferis, J.C. and Nam, J.D., “Investigation of Thermal Degradation Behavior Of Polymeric Composites: Prediction Of thermal Cycling Effect From Isothermal Data,” Composites Part A: Applied Science and Manufacturing, Vol. 31, No. 9, pp. 945-957, 2000. Poodts, E. Ghelli, D. Brugo, T. Panciroli, R. and Minak, G., “Experimental Characterization Of A Fiber Metal Laminate For Underwater Applications,” Composite Structures, Vol. 129, pp. 36-46, 2015. McGurn, M.T. Des Jardin, P.E. and Dodd, A.B., “Numerical Simulation Of Expansion And Charring Of Carbon-Epoxy Laminates In Fire Environments,” International Journal of Heat and Mass Transfer, Vol. 55, pp. 272-281, 2012. Christke, S. Gibson, A.G. Grigoriou, K. and Mouritz, A.P., “Multi-Layer Polymer Metal Laminates For The Fire Protection Of Lightweight Structures,” Materials and Design, Vol. 97, pp. 349-356, 2016. Maljaars, J. Soetens, F. and Snijder, H., “Local Buckling Of Aluminium Structures Exposed To Fire, Part 1: Tests,” Thin-Walled Structures, Vol. 47, pp. 1404-1417, 2009. Kandare, E. Feih, S. Kootsookos, A. Mathys, Z. Lattimer, B. and Mouritz, A., “Creep-Based Life Prediction Modelling Of Aluminium In Fire,” Materials Science and Engineering: A, Vol. 527, pp. 1185-1193, 2010. Feih, S. Kandare, E. Lattimer, B. and Mouritz, A., “Structural Analysis Of Compression Deformation And Failure Of Aluminum In Fire,” Journal of Structural Engineering, Vol. 137, pp. 728-738, 2010. Afaghi Khatibi, A. Kandare, E. Feih, S. Lattimer, B. Case, S. and Mouritz, A., “Finite Element Modelling Of Tensile Deformation And Failure Of Aluminium Plate Exposed To Fire,” Computational Materials Science, Vol. 95, pp. 242-249, 2014. Tewarson, A. and Macaione, D.P., “Polymers And Composites– An Examination Of Flame Spread And Generation of Heat And Fire Products,” Journal of Fire Sciences, Vol. 11, pp. 421-441, 1993. Koksal, F. Gencel, O. Bristow, W. and Hagg Lobland H.E., “Effect Of High Temperature On Mechanical And Physical Properties Of Lightweight Cement Based Refractory Including Vermiculite,” Material Research Innovations, Vol. 16, pp. 7-13, 2012. Dupuesne, S. Le Bras, M. Bourbigot, S. Delobel, R. Vezin, H. Camino, G. Eling, B. Lindsay, C. and Roels, T., “Expandable Graphite: A Fire Retardant Additive For Polyurethane Coatings,” Fire and Materials, Vol. 27, pp. 103-117, 2003. Vogelesang, L.B. and Vlot, A., “Development Of Fibre Metal Laminates For Advanced Aerospace Structures,” Journal of Material Process and Technology, Vol. 103, pp. 1-5, 2000. Young, J.B. Landry, J.G.N. and Cavoulacos, V.N., “Crack Growth And Residual Strength Characteristics Of Two Grades Of Glass-Reinforced Aluminum GLARE,” Composite Structures, Vol. 27, pp. 457-469, 1994. Asundi, A. and Choi, A.Y.N., “Fiber Metal Laminates: An Advanced Material For Future Aircraft,” Journal of Material Process and Technology, Vol. 63, pp. 384-394, 1997. Vasek, A. Polak, J. and Kozak, V., “Fatigue Crack Initiation In Fibre–Metal Laminate GLARE-2,” Material Science and Engineering, Vol. 234, No. 236, pp. 621-624, 1997. Sinke, J., “Development of Fibre Metal Laminates: Concurrent Multi-Scale Modeling And Testing,” Journal of Materials Science, Vol. 41, pp. 6777-6788, 2006. Kawai, M. and Arai. Y., “Off-Axis Notched Strength Of Fiber–Metal Laminates And AFormula For Predicting Anisotropic Size Effect,” Composites: Part A, Vol. 40, pp. 1900-1910, 2009. Vlot, A., “Low-Velocity Impact Loading On Fibre Reinforced Aluminium Laminates (ARALL) And Other Aircraft Sheet Materials,” PhD Thesis, Delft University of Technology, Delft, 1991. Rodi, R., “The Residual Strength Failure Sequence In Fibre Metal Laminates,” Master Thesis, Pisa University, Pisa, 2012. Zhu, G.L. Xiao, Y.P. Yang, Y.X. Wang, J. Sun, B. and Boom, R., “Degradation Behavior Of Epoxy Resins In Fibre Metal Laminates Under Thermal Conditions,” Journal of Shanghai Jiaotong University, Vol. 17, No. 3, pp. 257-262, 2012. Decelle, J. Huet, N. and Bellenger, V., “Oxidation Induced Shrinkage For Thermally Aged Epoxy Networks,” Polymer Degradation and Stability, Vol. 81, pp. 239-248, 2003. Colin, X., and Verdu, J. “Thermal Aging And Lifetime Prediction For Organic Matrix Composites,” Plastics, Rubber and Composites, Vol. 32, pp. 349-356, 2003. Colin, X. Mavel, A. Marais, C. and Verdu, J., “Interaction Between Cracking And Oxidation In Organic Matrix Composites,” Journal of Composite Materials, Vol. 39, pp. 1371-1389, 2005. Pochiraju, K. Tandon, G. and Schoeppner, G., “Evolution Of Stress And Deformations In High-Temperature Polymer Matrix Composites During Thermo-Oxidative Aging,” Mech Time-Depend Mater, Vol. 12, pp. 45-68, 2008. Lafarie-Frenot, M.C., and Rouquie, S., “Influence Of Oxidative Environments On Damage In C/Epoxy Laminates Subjected To Thermal Cycling,” Composites Science and Technology, Vol. 64, pp. 1725-1735, 2004. Tsotsis. T.K. Keller, S. Bardis, J. and Bish, J., “Preliminary Examination Of The Use Of Elevated Pressure To Accelerate Thermo-Oxidative Ageing In Composites,” Polymer Degradation and Stability, Vol. 64, pp. 207-12, 1999. Burcham, L.J. Eduljee, R.F. and Gillespie, J.R.J.W. “Investigation Of The Microcracking Behavior Of Bismaleimide Composites During Thermal Ageing,” Polymer Composites, Vol. 16, pp. 507-517, 1995. Fan, W. Li, J.L. and Guo, D., “Effect of Thermo-Oxidative Aging On Three-Dimensional And Four-Directional Braided Carbon Fiber/Epoxy Composite,” Journal of Composite Materials, Vol. 49, No. 25, pp. 3189-3202, 2015. Ozcelik, O. Aktas, L. and Altan, M.C., “Thermo-Oxidative Degradation Of Graphite/Epoxy Composite Laminates: Modeling And Long-Term Predictions,” Express Polymer Letters, Vol. 3, No. 12, pp. 797-803, 2009. Yoon, P.J. Fornes, T.D. and Paul, D.R., “Thermal Expansion Behavior Of Nylon 6 Nanocomposites,” Polymer, Vol. 43, pp. 6727-6741, 2002. Saad, G.R. Abd Elhamid, E.E. and Elmenyawy, S.A., “Dynamic Cure Kinetics and Thermal Degradation of Brominated Epoxy Resin–Organoclay Based Nanocomposites,” Thermochimica Acta, Vol. 524, pp. 186-193, 2011. Shen, S.Z. Bateman, S. McMahon, P. Dell Olio, M. Gotama, J. Nguyen, T. and Yuan, Q., “The Effects of Clay On Fire Performance And Thermal Mechanical Properties Of Woven Glass Fibre Reinforced Polyamide 6 Nanocomposites,” Composites Science and Technology, Vol. 70, No. 14, pp. 2063-2067, 2010. Haque, A. Shamsuzzoha, M. Hussain, F. and Dean, D., “S2-Glass/Epoxy Polymer Nanocomposites: Manufacturing, Structures, Thermal And Mechanical Properties,” Journal of Composite Materials, Vol. 37, No. 10, pp. 1821-1837, 2003. Masoudi, A. Liaghat, G.H. 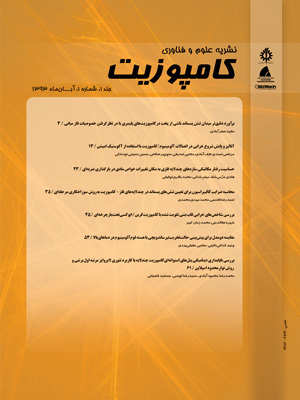 and Pol, M.H., “Experimental Investigation Of Effects Of Nanoclay On Ballistic Properties Of GLARE,” In Persian, Modares Mechanical Engineering, Vol. 14, No. 4, pp.141-146, 2014.
 http://www.millproducts-alcoa.com, available in 22, September 2016.
 http://www.swiss-composite.ch/ pdf/ t- Araldite- LY5052- Aradur 5052-e.pdf, available in 22, September 2016.
 http://www.colan.com.au/compositereinforcement, available in 22, September 2016. Zainuddin, S. Hosur, M.V. Zhou, Y. Kumar A. and Jeelani, S., “Durability Study Of Neat/Nanophased GFRP Composites Subjected To Different Environmental Conditioning,” Materials Science and Engineering A, Vol. 527, pp. 3091-3099, 2010. Chowdhury, F.H. Hosur, M.V. and Jeelani, S., “Studies On The Flexural And Thermomechanical Properties Of Woven Carbon/Nanoclay-Epoxy Laminates,” Materials Science and Engineering A, Vol. 421, pp. 298-306, 2006. Sun, X. Li, R. Wong, K.C. and Mitchell, K. A. R., “Surface Effects In Chromate Conversion Coatings On 2024-T3 Aluminum Alloy,” Journal of Materials Science, Vol. 36, pp. 3215-3220, 2001. Wei, C.L. Zhang, M.Q. Rong, M.Z. and Friedrich, K., “Tensile Performance Improvement Of Low Nanoparticles Filled-Polypropylene Composites,” Composites Science and Technology, Vol. 62, pp. 1327-1340, 2002. Manfredi, L.B., and De Santis Vázquez, H.A., “Influence of The Addition of Montmorillonite To The Matrix of Unidirectional Glass Fibre/Epoxy Composites On Their Mechanical And Water Absorption Properties,” Composites: Part A, Vol. 39, pp. 1726-1731, 2008. Khan, S.U. Iqbal, K. Munir, A. and Kim J.K., “Quasi-Static And Impact Fracture Behaviors Of CFRP With Nanoclay-Filled Epoxy Matrix,” Composites: Part A, Vol. 42, pp. 253-264, 2011. Yasmin, A. Luo, J.J. Abot, J.L. and Daniel, I.M., “Mechanical And Thermal Behavior Of Clay/Epoxy Nanocomposites,” Composites Science and Technology, Vol. 66, No. 14, pp. 2415-2422, 2006. Jang, B.N. and Wilkie, C.A., “The Effect of Clay On The Thermal Degradation Of Polyamide 6 In Polyamide 6/Clay Nanocomposites,” Polymer, Vol. 46, pp. 3264-3274, 2005. Kashiwagi, T. Harris, R.H. Zhang, X. Briber, R.M. Cipriano, B.H. Raghavan, S.R. Awad, W.H. and Shields, J.R., “Flame Retardant Mechanism Of Polyamide 6-Clay Nanocomposites,” Polymer, Vol. 45, pp. 881-891, 2004. Ohno, S. Lee, M.H. and Lin, K.Y., “Thermal Degradation Of IM7/BMI5260 Composite Materials: Characterization By X-Ray Photoelectron Spectroscopy,” Materials Science and Engineering: A, Vol. 293, pp. 88-94, 2000.